The Sport for Development Coalition's latest Twitter takeover set a new record this week. More than 100 organisations and individuals participated in the live discussion, which is hosted by @ConnectSport, and responded to the five pre-set questions or shared and debated the answers, with a cumulative following of over 360,000. By comparison, 72 accounts engaged with the first takeover in October. January’s theme was 'Building stronger communities through sport and physical activity' and special guest for the live event on social media was StreetGames Deputy Chief Executive Mark Lawrie, who provided some fascinating insight into the work of one of the UK’s leading Sport for Development charities. Mark was tweeting just a few days after it was announced that Sport England had awarded £6.65million to StreetGames to tackle inactivity in 50 disadvantaged communities across the country. Sport for Development manager Sarah Mortiboys said: “We are delighted with the support the Coalition has received from the wider sector, and very grateful to organisations like StreetGames for taking time out to share best practice and lead by example. 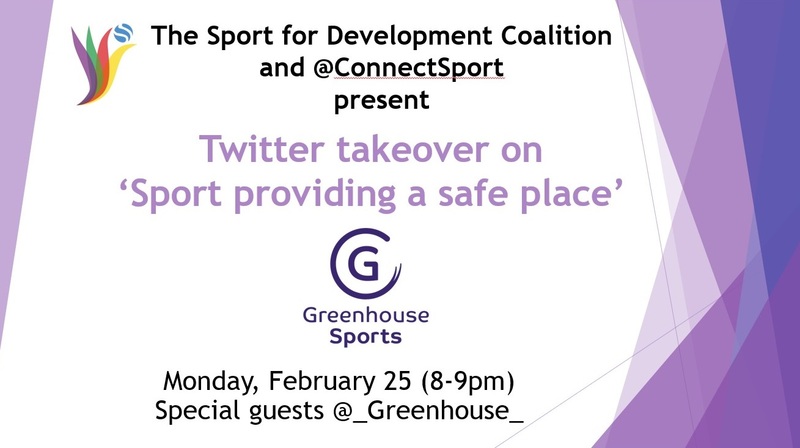 “We look forward to welcoming another leading charity, Greenhouse Sports, who will be our guests for the next Twitter takeover on the evening of Monday, February 25th. Any organisation using sport or physical activity to generate positive social outcomes is encouraged to submit a response to our February ‘call for articles’ on the theme. The articles and blogs will be shared by ConnectSport and Coalition members on social media throughout the month to help raise awareness of your work, and encourage collaboration and partnerships.